Melita coffee maker, is the inventor of the filter paper and a company that grows by innovating its products, from filter paper to coffee maker and now to single serve. Currently, its hot product would be the Melitta One, a single serve coffee maker. 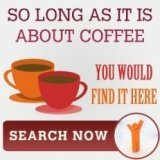 **In case, you are still wondering what is wrong with the melita coffee maker, it is actually the name, they are actually know as melitta coffee maker, click on the link to read more about "the real thing"
I would assume that you are reading this article is because you are looking for the Melitta One. 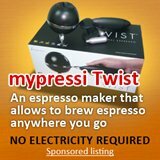 Most likely, wanting to get some reviews prior to making any purchase -wise. The Melitta One is a one cup coffee maker that makes great coffee, with dazzling variety -so what, isn't Senseo also giving great cuppa with Douwe Egberts' coffee? It might not be so complicated. But, to me, choosing a single serve is akin to making a long term commitment. Imagine, you cannot choose the coffee and have to be at the mercy of companies like Melita, to determine the types of coffee you drink. That being said, if a company is more innovative and progressively changing, theoretically you would have more choices. And Melita, is one such company. They come about because of the filer paper. And this was invented after 3 century of coffee drinking where people did all they know about coffee but all they invented was metal or porcelain sieves. This filtration sieves either allowed too much ground to cloud the coffee or were so slow that you end up drinking cold coffee. In 1908, Melitta Bentz, a German changed all that by using her son blotting paper as the filer and putting it in a brass pots with holes. And that was the first Melita Coffee maker. And with this innovation, an entire company was born. Then in the 1960's, long before anyone was talking about one button coffee solution, melita coffee maker came out with the "8 cups in 5 minutes at the press of one button" MA120. Taking note that at that period, coffee preparation was still a ritual, from the bean grinding to the brewing, everything was done by hand. Then, with the proliferation of one cup coffee maker, Melita coffee maker introduces the Melitta One. A truly one button solution, just insert the coffee pods, press a button and then the perfect coffee. 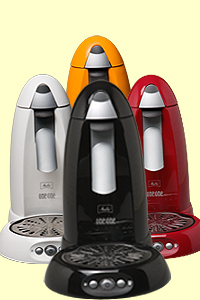 If it is a single serve machine then you would need to have exclusive pods.The strength of Melita, is the range just keep growing. A plus point for anyone that is always looking for new exciting flavor. The point which I am driving across, is choose a coffee maker, especially a single serve, if you like the coffee and also if the company can cater to your needs. For example, if you just want to have a quick caffeine boast and is not very particular about the body, profile etc, then a Nescafe Gold Blend's instant coffee would be a much better choice, instant and so much lower in cost. Single cup machines, like melita coffee maker is much more than instant and fast solution, it is about enhancing (although simplifying) the coffee experience. 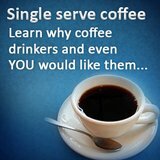 And if you want to have coffee experience, knowledge is essential. So, before any purchase or succumbing to any sales pitch, first decide the taste you like, determine if the company in view can cater to your needs. i.e. if you like changes, would the company introduces new range regularly?. 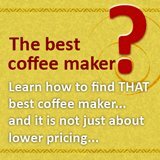 Or you want to look for other coffee makers?